This is a brand new, OEM A/C compressor for your C5-allroad with the 4.2L V8 (BAS engine code). Similar to the B6-B7 S4 AC Compressors, the AC compressor found in the C5-allroads with the Timing Chain 4.2L V8 have a very high failure rate. 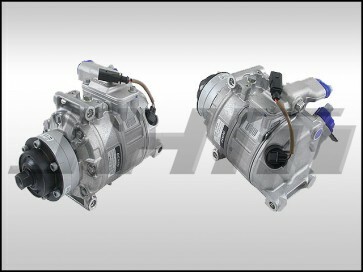 They are a clutchless style compressor meaning that they are always moving whenever the motor is running. This causes much more wear and tear on the compressor leading to early failures. NOTE: If your previous compressor failed internally, you MUST flush your system thoroughly and replace your receiver drier prior to replacing. We also recommend replacing the A/C Orifice Tube as well. If any debris from your old compressor are found in the new compressor it WILL void the warranty. No Exceptions.